There's just something to love about wine corks. They, like those unique buttons, each have a personality and history. My husband and I really enjoy trying different types of wine, and the corks tell stories of the vineyards we've tasted, so I can't throw them away. Luckily, before our collection got out of control, we visited a bunch of cute local shops and inspiration hit. Which means they can retain their character and have added functionality, too. Beautiful. 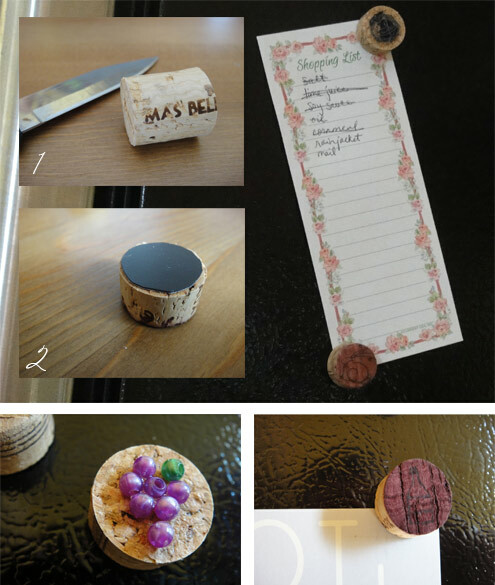 I experimented with a few different approaches to decorating them, but basically you cut the cork into four slices, glue a magnet to the back, decorate the front (or leave as is, if you like), and you're done! I love this idea!! I have a few corks laying around too! !